Aequidens pulcher common name blue acara. They can grow up to 12-13 cm / 5 inches. They are best kept in water parameters of PH range 6.5-7.5, and temperatures of 25-28 cm / 77-82 °F. 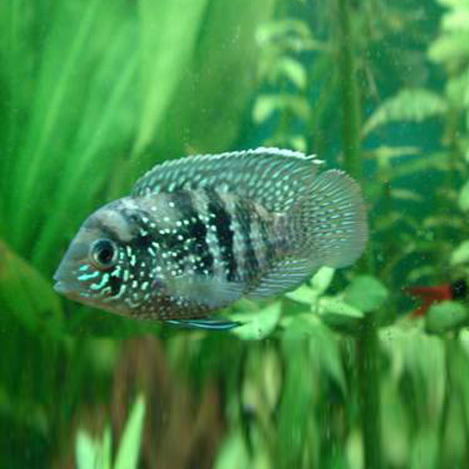 The blue acara are a type of cichlid fish. They however are not an aggressive cichlid, but they can still be nasty with smaller fish. They are best in pairs or in small group, as one on its on can hide. The blue acara will eat any food you put in the tank for them, but as they are shy fish you do need to sink the food to make sure they eat it. They will enjoy pellets, or granular foods. But a colour enhancing food is always good to keep there lovely colours bright. Also feeding them frozen and live foods is always good for a treat. Blue acara will eat any food you put in the tank. but as they are a shy fish make sure they eat the food. Feeding live and frozen foods is best as they need meat in there diet.